The first district that offered walking tours with Local Guides back in 2011 was Zaspa. This is one of the largest clusters of panel housing blocks in Poland. Their trademark feature are colourful murals painted by 64 artists from 16 countries. All in all, there are 60 works of art on the walls of these blocks. The collection is acknowledged in Poland and abroad; there’s even a documentary by TVP Kultura (Bloki “Sztuka”) where you can hear Piotr Szwabe, curator of the Monumental Art Festival (2009–16) and Local Guide Jarek Orłowski. 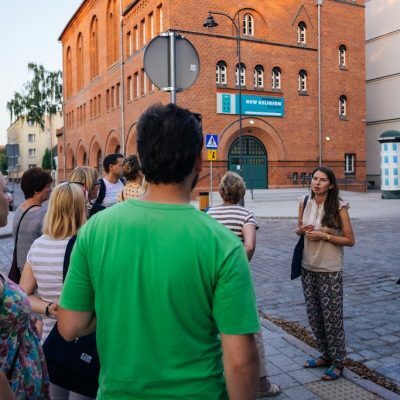 The best way to get to know the district, its history, the rationale behind the urban planning and historical events that took place there is taking a summer walk with Local Guides. Walk around the Monumental Art Collection in Zaspa takes place on 11 August (Saturday) at 4 p.m. Starting point: in front of Plama GAK, 11 Pilotów St. When sightseeing around the area of the former shipyard, guides talk about the buildings that are no more, such as the representative canteen, the old clinic or the seat of the shipyard’s administration. We can still visit the former seat of the management, the famous OHS room where the Gdańsk Social Accord was signed, the historical gate no. 2, assembly room no. 42 A, Pipe Fitting Deparment and slipways. The walk introduces participants to the everyday lives of female Shipyard workers and engineers, the hardships faced by female welders, constructors and cleaners and the fight of women responsible for installing insulation for better work conditions. This is also a story about women involved in the August 1980 strikes: both those that are well-known, and the anonymous ones – workers and members of the intelligentsia, without whom the August 1980 strike in the Gdańsk Shipyard would not have been possible. Walk around the shipyard takes place on 18 August (Saturday) at 4 p.m. Starting point: Historical Gate no. 2. Walk around Dolne Miasto takes place on 25 August (Saturday) at 4 p.m. Start in front of Stągwie Mleczne, 14 Motławska St.